The Experienced Travelers welcome the New Year, which means it’s time to take another trip to France! Oh joyful tidings! We trust that our dear Readership celebrated in style, unless you follow the French Revolutionary calendar that begins the year with the autumn equinox. In that case, you retired early with your “Collected Speeches of Robespierre” and woke refreshed. The French celebrate News Years Eve with the festivities of the Réveillon de Saint-Sylvestre. Naturally we followed suit with an eclectic menu and plenty to drink in the company of fine friends. But fortunately for them, we drew the line at another French tradition, the soirée dansante (ball). Well, our taffeta gowns were at the laundry so what were we to do. In France, the practice of kissing under the mistletoe is a New Year’s custom. We think that’s because it’s easier for an ambitious Frenchmen to skillfully negotiate a young maiden to the mistletoe after she’s had several glasses of New Year champagne. Once we’ve shaken off the vintage blessings of Saint-Sylvestre, we’ll be ready to put the ET bonne résolutions de nouvel into practice. 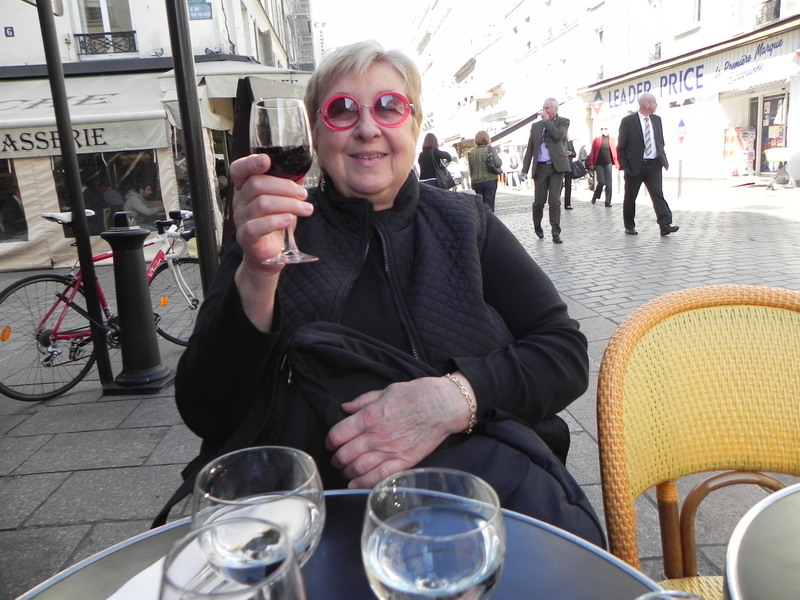 Nurse is in marathon training after her 2011 knee surgery so she can walk from the Ecole Militaire to the upper Marais, with necessary cafe stops along the route. Et moi, I will re-read Proust now that I have some notion of what the story is about. And we’re knee deep in maps and websites, planning our pilgrimage to Paris in the spring. So ring in the new, dear Readership and happy 2012! 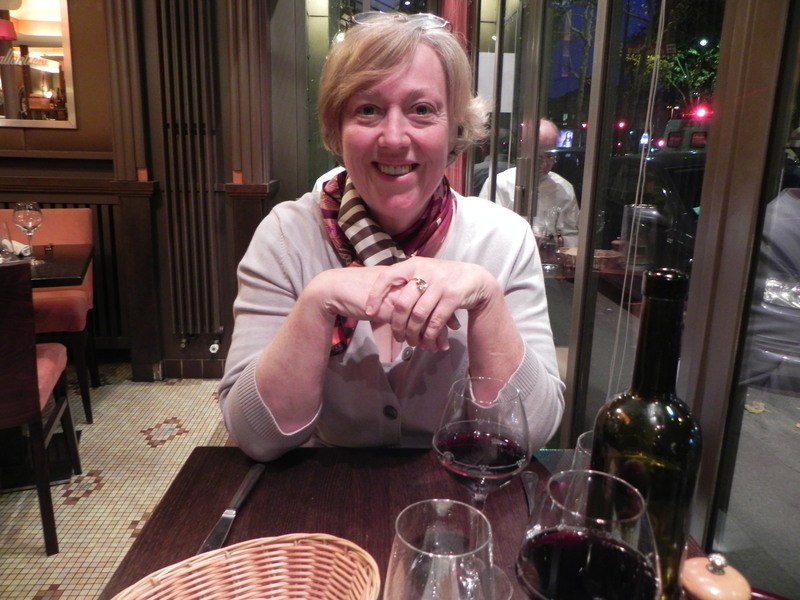 Here's hoping 2012 holds more Parisian dining for the ETs - and for you! This entry was posted on January 2, 2012 at 5:57 pm and is filed under Uncategorized. You can follow any responses to this entry through the RSS 2.0 feed. You can leave a response, or trackback from your own site. Happy New Year, Ann and Julie! Allison thanks and happy new year to you as well. I hope you’re enjoying the Florida sun and feeling sorry for those of us who expect 6 inches of snow tonight! I am so excited you will be here *en transit à Paris* ! Can’t wait to see you! The ET’s will have to share some Italy experiences with us! Happy New Year, my dears! We’re looking forward to seeing you enroute! Send more info on your Italy itinerary – ciao!